The cottage is set in a large garden which is surrounded by dry stone walls. Front access is via 3 stone steps and a traditionally styled door. There is an enclosed patio area and a yard at the rear for small kids. 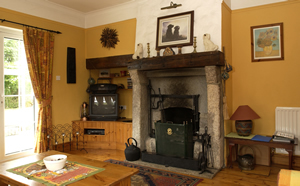 Sitting room: The main feature is a traditional stone fireplace from the original old cottage. This spacious room is warmly decorated with reclaimed wooden floors. Kitchen: The units are styled in antique pine and there is a monks bench with traditional styled table and chairs for having a bite to eat. 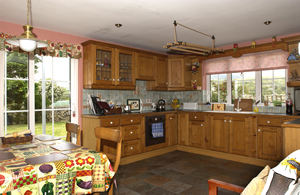 The kitchen is fully equipped with electrical cooking goods, all other utensils are supplied. In the utility room there is an automatic washing machine, tumble dryer, dishwasher, microwave and small freezer. Bedrooms: There is a double, twin and bunk room, each sleeping two. The bunk and double room contains fitted furniture with vanity units. * The cottage is painted in warm strong colours. * There are wood floors throughout with tiles in the kitchen area. * Other extras include a TV, CD, Video and DVD Players. * The house sleeps 6. "I just wanted to say how much we enjoyed your lovely little heavenly getaway last week....."